Drawing upon a lifetime of love for kittens and many years of clinical experience, our veterinary staff would love to help you become more informed about your kitten's needs. There are many phases of a kitten's life and it is important to understand how your cat's needs will change as they grow. We have compiled some essential kitten care information for you below. Our Valley West location has acheived the Cat Friendly Practice designation through the American Association for Feline Practitioners (AAFP), and the doctors and staff members at Elk Valley are also thoroughly trained in cat-friendly techniques. Whichever location you choose, you can be sure that your kitten will receive elevated and quality care throughout the entire experience. Proper kitten care requires an examination by a cat-friendly veterinarian, kitten vaccinations, deworming and other forms of care that support development throughout the various phases of kittenhood, and we will go above and beyond to ensure that your kitten is comfortable throughout it all. Under 4 Weeks of Age: Kittens are considered newborn kittens from 0-4 weeks of age. During this time, newborn kittens are just developing motor skills and coordination. They are also learning how to regulate body temperature. At this time in their life, they count on their mother for warmth. If the mother cat is still with the kittens there is very little required for human caretakers besides a warm safe environment for all of them, as well as good nutrition and veterinary care for the mother cat. If for some reason the mother cat is not able to care for the kittens, then a fair amount of care is required to help the kittens grow and thrive. Schedule an immediate visit to see us with the kittens so we can review the kittens' needs, especially relating to feeding and monitoring their progress. This includes bottle feeding kittens every 2-4 hours, keeping their environment warm and safe, and helping the kitten to urinate and defecate. Be sure to keep them warm with blankets, especially if they have been separated from their mother and/or siblings. You can definitely hold the kitten during this time, but please be extra gentle because their bones are still forming. 5-11 Weeks of Age: By this time, newborn kittens should be weaned off of their mother or bottle-feeding, and be fed with a high-protein, energy-dense diet. During this stage, their motor skills and coordination should also be progressing. Beware that when this happens, your kitten will become a force to be reckoned with! Taking care of a kitten at this age includes proper supervision to ensure that your kitten's newfound sense of adventure and bravado doesn't lead them into dangerous situations. 2-4 Months of Age: This is a period of rapid growth in kitten development. You should expect your kitten to have a lot more energy than an adult cat and she might wake you up in the middle of the night to play. Taking care of a kitten during this phase includes both bonding-based playtime and giving 3 or 4 high-protein meals per day. 4-6 Months of Age: Your kitten is reaching an age of adolescence and therefore, sexual maturity. This will result in an increase of energy and some behavioral changes similar to an adolescent human child entering puberty. Taking care of a kitten during this phase includes continuing hands-on bonding-based playtime with the addition of behavior modification if necessary. There are many ways to enrich your cat's environment, which is especially important for indoor kittens. During your next appointment we can discuss ways to build an enriched environment that provides the right amount of stimulation your kitten instinctively desires. When your kitten reaches about 6 months of age, it is time to schedule your kitten to be spayed or neutered. Most kittens will go through puberty at approximately 6-8 months and it is recommended that they are spayed or neutered just before then to avoid unwanted kittens. By 5-8 weeks of age, your kitten should be able to chew its own food, and you should provide a protein-rich and energy-dense diet, with feedings taking place 3-4 times daily. There are many different types of kitten food available, and we can discuss these dietary options with you at your next veterinary appointment. Typically we recommend canned food because it will mimic the natural diet both in consistency and formulation. However, a good diet may also consist of a combination of canned and dry cat foods. As you can see, kitten development is filled with fun but requires active involvement in the process. It is crucial that you consider the time commitment necessary to do your part and ensure proper kitten development. 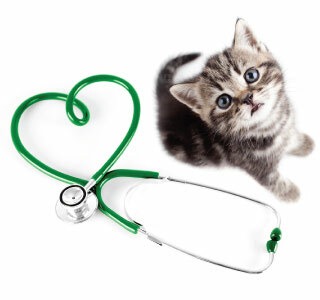 Preventive care is important in ensuring your kitten is given the best opportunity to live a healthy life. Preventive kitten care begins with finding the right veterinarian and working with them to implement a sound checkup, kitten vaccinations and a preventive maintenance schedule. As experienced veterinarians, we are able to pick up on subtle signs that something may not be quite right with your kitten. Between a thorough discussion with you and a physical exam, our veterinarians will be able to identify health or behavioral issues that your kitten may be experiencing. The following are some helpful tips to begin planning for the long-term health of your kitten, and overall positive kitten development. Of all threats to your kitten, one of the most common and annoying parasitic dangers is fleas. A discussion about your cat's lifestyle and proper flea and tick control is an important component of kitten care. We do not recommend over-the-counter sprays, powders and collars. They are less effective and more toxic to your kitten. At your next appointment we would be happy to discuss an effective flea/tick and overall parasite prevention program. Schedule A Kitten Care Appointment With Valley West and Elk Valley Veterinary Hospitals Today! While caring for a kitten can certainly be one of the most fun and rewarding experiences you can have as a pet owner, if you are uninformed about the needs of your kitten during this time, he could have a developmental disadvantage. At Valley West and Elk Valley Veterinary Hospitals kitten care is one of our greatest joys. Our veterinary staff would be delighted to spend some time with you and your kitten ensuring that your relationship will be a healthy, happy and rewarding one for many years to come. Schedule your first kitten care appointment today!